Yesterday’s post covered the most important step in making Persian Chicken Kabob which is marinading. Today I am going to show you how to cook it. It is a hot day today in LA and standing in front of the hot BBQ was not necessarily fun, but let me tell ya, the kabob was soo soo good that it was worth every second! Look at those luscious pieces of chicken in the picture above, aren’t they appetizing? 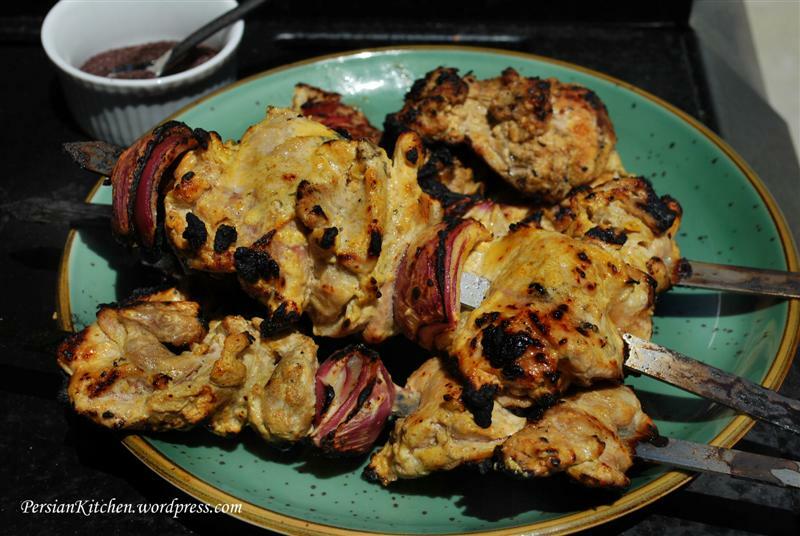 Persian Kabob is always skewered and usually cooked over charcoal. We have a gas grill and what we did is take off the grill and placed the skewers on top of the flame. I skewered some of the chicken and I left some to just throw over the grill. Collect all of your needed items. I like to use gloves because I hate the slimy feeling of the chicken and marinade. You may want to use a long rectangular dish or you can do what I did. I covered a cookie sheet with aluminum foil. This is a little messy so just have everything close to you. Skewer chicken pieces and onion pieces. You can choose to cut your chicken in pieces or just put them on whole. Whatever you do make sure that the pieces don’t hang too low and are as close as possible to the skewers. Warm up your grill and place chicken on top. As you can see we took off our grill on the right side for the skewers. Make sure that you season your chicken with salt. Can I tell you a secret? Don’t do what you see The Sous Chef doing here. I nearly had a heart attack when I saw him pour sea salt from its container like that. Given that he was in a hurry and we were both hungry I just kept my mouth shut and prayed that the results would not be so salty that I could not take a second bite. Always take a pinch of salt and pour on food from a distance so that you have control over amount and distribution. Turn skewers so that all sides cook. Baste chicken with the marinade as it cooks. Yum! Look at it. So delicious looking with grill marks on both chicken and onion pieces. Cook chicken on each side for about 8 minutes. Please note that the pieces set on the grill will cook faster than the pieces on the skewer. Check chicken with a food thermometer. Once the temperature reaches 160°, your chicken is ready. Place some Somagh on top for extra flavor. The kabob should be tender, moist, flavorful, and a little tangy. Jujeh Kabob, or Persian Style Chicken Kabob is usually served with Chelow, white rice. But you can also just make a sandwich with Lavash bread. This is great. But do you have any tips on how to cook great kabob (all kinds) without a BBQ? In the winter time we don’t have access to the BBQ and have to use the stove or the oven. I don’t know how to make anything other than pan kabob (where the ground beef is onions flattened on a pan). Hi so how does it work? You marinate the chicken the same way and put it on a seekh? And then use the GF grill? Anything else I should know before I do this? Do you use it beef kabobs as well? Thank you. I usually marinade the chicken over night and just place them on the GF without putting on the seekh. I have used wooden skewers before, but there is not need for it. Flip the pieces half way through and you are good to go. Don’t forget the little juices/fat tray as you will have a lot of liquid that will run down. Also, make sure not to over cook the chicken. I have never made Persian beef kabob on the GF but I have made kofteh and grilled them on it. They come out really good. I just saw the posting about jujeh kabob in doors. I can’t wait to try it. But I thought I was the first one to bring this up. Who is Anahita?!?!?! LOL I can’t wait to try it. I can’t find the Sadaf Seasoning – any suggestions on what spices to use instead? Thank you. We’re actually preparing kabobs for our daughter’s Persian New Year celebration at school tomorrow. Thank you. May, you can use salt, pepper, saffron, and turmeric along with Lime or lemon juice. That’s the most basic type of seasoning for marinades. I hope this helps! I am trying to locate the Persian skewers for our use. I live a long way from a good Persian store … any ideas? Thanks! Shaunna, you can try and purchase them online if you are not close to a Persian store. This is great, but can you give me a recipe for beef koobideh? Laila, I am working on perfecting the recipe for koobideh! I want to use the GF Grill for Koobideh, Barg, and Jujeh…should I go the GF Grill route or the outdoor gas grill? Any special instructions either way? Babak jan, great question. I have only made chicken kabob on mine. You should be able to do them all on it though, however, the cooking time on GF grill is much less. I should probably do a post on how to make Jujeh Kabob on my Georgie (GF Grill). I like your website. It’s easy on the eyes. My question ; have you ever marinated a turkey in yogurt. I think it would be better than a brine. Happy Thanksgiving! The Nuwave oven would work well for this if you can find skewers that are short enough. I will put some on the Weber kettle and some on the gas grill when I try this. I’ve just discovered your lovely website, and want to try making all dishes! My boyfriend is persian and the way he cooks rice is just AMAZING – I think persians have it in blood! He showed me a couple times how to cook rice but I couldnt make it right! I very much like Persian kabobs (I know exactly how to pronounce it in persian :P) but I dont have grill, so do you think it will come out nicely if I just cook it in oven at 180C? I’ve noticed that some of the links in your recipes dont work, like Chelow white rice and Marinading (aka Part 1) on this webpage! I’d be grateful if you could fix them. Cheers! What is the marinade made of? And how long do you marinade for?